I like HK, but I think this is a big much! My daughter has 2 HK key chains that hang from my car mirror, and that is ALL that I will allow! On the positive side, the chances that car will *ever* get stollen are zero. Someone vomited HK in that poor car. Like the slippers though. I love it, and can only imagine how insanely hot the Japanese girl is that drives it….. This looks like a five year old’s bedroom. Too much Kitty. It’s cute, but it’s a bit hazardous. 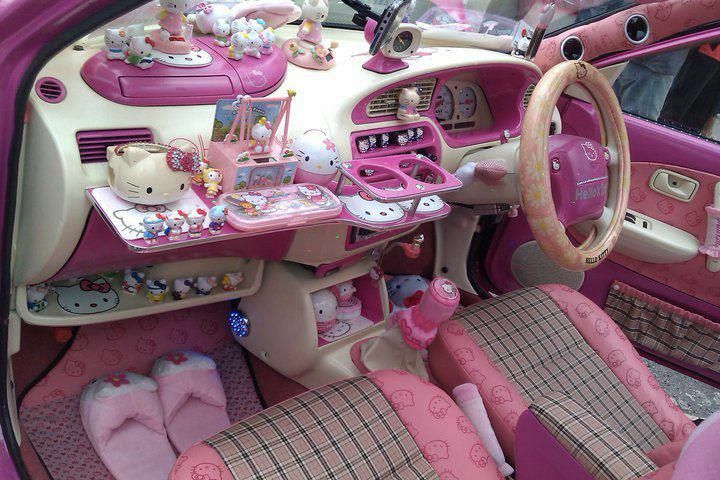 Wow, that car is out of control w/all that HK stuff! Is this the cute but I hope everything is secured just incase of sudden stops or if Mr. HK Hell tries to ram you. I would be proud to ride in your car. If you look REALLY close, you can see that the gas pedal on the drivers side also has slippers! <3 I like the colors and the seat covers and steering wheel, shifter, and e-brake, but I wouldn't put that many figurines and decorations up. Cute though. The cupholders are a nice touch. :O :O :O SOOOOOOO CUTE! The figurines and stuff freak me out, because if you get in a car accident, ALL that stuff goes airborne and can injure the unlucky person sitting in front of it. Not fun. It just looks super cluttered to me. I have the inside of my car HK theme, but not to this extent at all. I just have the floor mats, seat covers, and the steering wheel cover. The reason I got it is actually because my car is purple, and it’s one of the only “themes” that had matching purple in it. That said, my backseat cover is a mexican blanket. I’m a fan of themes that are not super over the top and have other things mixed in. Otherwise it just looks too overwhelming and ridiculous. Kind of like if your WHOLE HOUSE is HK themed, you can’t appreciate the couple of items that you love because they get lost in sea of crap. I’m not a fan of collecting something simply because of it being HK, I have to actually like the ITEM itself too, and have a use for it. I would take it without problems. I love it. Greetings from Israel. oh my gosh that is soooo cute!!!! *0* I love this car. Curiosity has got the better of me, does anyone actually know what make of car was the victim of this? I love Hello Kitty but this is a bit much. But on the plus side I’m thinking this car probably won’t be stolen. how much all kitty in car? What spoils and utterly ruins the camp pink Hello Kitty driving machine of wonderment is those revolting check seats. It looks like a chavs Burberry check has been cut up and stitched on the seats. Or Ruperts scarf. I hope the outside is shaped like a giant Hello Kitty with blinking eye headlights and “tail” lights.